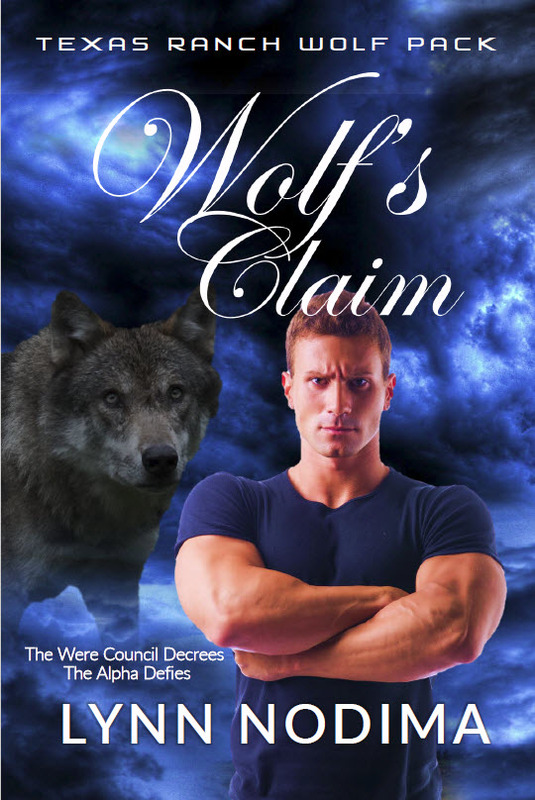 In a previous post, I shared my revised cover for the next book in the series, Wolf's Claim. The writing is going well, and I'm over 11,000 words, now. I received my work back from my beta reader and made some changes that tightened up the prose and made the book a better read. At least that is my hope. I would love to read your comments. Please post them below. Nate ran his hand through his hair and tried again to make sense of the figures in the spreadsheet columns. So much had happened in the last week, he felt out of his depth. I’m a cop, not an accountant! Cops are supposed to work in the public, not be cooped up in an office reading complicated spreadsheets. Though he knew Koreth would hear and understand his thoughts, Nate had decided it was easier to keep his own thoughts separate from Koreth’s by speaking out loud when there was no need for silent communication. Deep in his mind, Nate felt Koreth’s amusement. “We’re on our way. Umm, there are 27 of us, counting me.” Ben cleared his throat. “We’ll be ready.” After ending the call, Nate shoved the spreadsheets into a drawer. Koreth sent an assembly call to the pack as Nate headed downstairs. Nate closed his eyes and tilted his head back. Sudden silence swept the room as he changed. Not into a wolf, but into the wolf-man of ancient legend. Instead of shrinking into Koreth’s wolf form, Nate grew until he stood seven feet tall. His shoulders widened, the fabric of his t-shirt shimmering away. Nate brought his face down, his glowing red eyes fixed on his pack. His snout twitched, sniffing the pack. Behind him, his tail ripped through his jeans and swished from one side to the other. As one, the pack scooted their chairs away from the table and dropped to their knees, heads bowed. So, when did we start using the royal ‘we?’ Nate asked Koreth. In his mind, Koreth smirked at him. When we became Us. As quickly as he became wolf-man, Nate shimmered and once again became human. The pack kept to their knees. Frowning, Nate walked to Janelle, captured her elbow in his large hand and gently pulled her to her feet. He cupped her face in his right hand and raised her eyes to his. There was wonderment in her eyes. That he could understand. He was a bit overwhelmed with his new change ability, too. What he didn’t expect and didn’t like was the touch of fear he saw in her eyes. For a long moment, Nate studied her worried brow and her fearful eyes. Our mate is right. This is not for them to know, yet. Nate sighed and ran his right hand through his hair. Okay. I’ll keep quiet about it for now. He could feel Koreth’s sympathy for him and his questions. Janelle slipped her smaller hand inside his and walked with him through the house to the front porch. 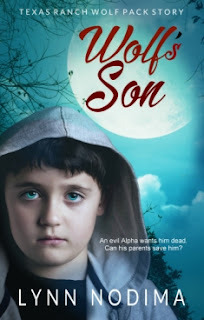 Behind him, he could hear whispers, then Koreth’s booming command filled Nate’s head. Command was given. You will obey! Nate heard the boys sniggering. Glancing over his shoulder, he quirked an eyebrow at them. The girls started giggling, hands covering their mouths. He could tell the boys wanted to laugh and were just a bit afraid to. To be continued . . .. Thank you for reading this two chapter excerpt. Please let me know what you think. P.S. The first book in the Texas Ranch Wolf Pack Series, Wolf's Man, is available on Amazon.com. Click here to learn more about Lynn Nodima! Click here to read the first chapter of Wolf's Man! 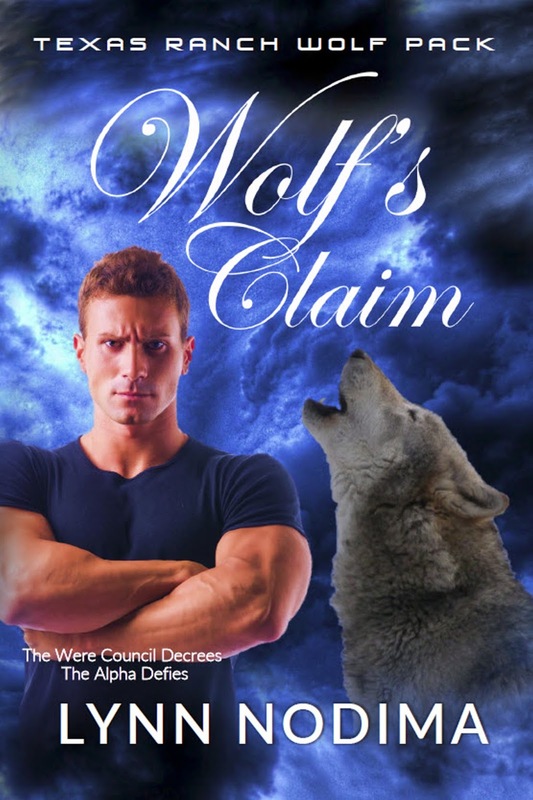 Read Wolf's Claim FREE in KindleUnlimited! Exclusive to Lynn's Muse Newsletter Readers! Click here to register for Lynn's Muse and get your FREE short story! When you register, you will receive occasional newletters from Lynn Nodima, Lynn's Muse. You will always be able to unsubscribe at any time. Lynn Nodima’s desire to write started before she started school. Her mom would sit the children in a circle and tell round-robin stories, with each child adding to the story. The activity is one of Lynn’s favorite memories. She toyed with the idea through junior high. On the last day of eighth grade, the students had to tell what they wanted to do with their lives after high school. She answered, “to be a famous writer like Heinlein.” No one in the class knew who she was talking about. If you asked Lynn why she writes, her answer would be that she can’t not write. Writing is too much a part of her life. 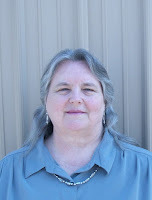 Visit Lynn's Amazon Author Page to see a list of her books on Amazon. Lynn Nodima is a pen name. The image above is Lynn Nodima, a few years ago. To learn more, visit Who is Lynn Nodima? Disclosure Notice Many of the links on this blog are affiliate links. If you click on any link in this blog and make a purchase, the blog owner may receive a small advertiser's commission at no extra cost to you. Thank you! Data is vital in any business, including the business of authoring. If you are an author, you can get the data you need at K-Lytics.com! The owner of this blog is an Amazon affiliate. If you click on any link and make a purchase, she may receive a small advertising commission at no extra cost to you. Thank you for helping support the blog! All content copyrighted by Lynn Nodima. Ethereal theme. Theme images by Jason Morrow. Powered by Blogger.